A woman carries her little son from her home which was flooded by rains brought on by Hurricane Irma, in Fort-Liberte, Haiti, Friday Sept. 8, 2017. Irma rolled past the Dominican Republic and Haiti and battered the Turks and Caicos Islands early Friday with waves as high as 20 feet. CABARET, Haiti – Emergency responders from the United States and Europe rushed to aid idyllic islands ravaged by Hurricane Irma as weary authorities in the eastern Caribbean fortified shelters and evacuated residents Friday ahead of a looming second blow by Hurricane Jose. Irma scraped north of Haiti, causing more limited flooding than feared in the impoverished country, but was battering the Turks and Caicos Islands, Cuba and the Bahamas on its drive toward Florida. In Irma's trail, emotional pleas went out on social media about isolated, hard-hit islands, including some where food and water were running low. Residents and officials accustomed to the charms of pastel towns and the gentle rustle of banana trees in jade-colored hills mourned their ruined isles. Still, the death toll – at least 22, according to the Associated Press – appeared remarkably low, given the scenes of destruction in the Caribbean. On the devastated island of Barbuda, authorities and private tour operators scrambled to evacuate the remainder of the 1,600 residents to emergency shelters on nearby Antigua. Barbuda was a tropical ghost town of broken buildings and fallen trees. Michael Joseph, president of the Red Cross in Antigua and Barbuda, said that Barbuda was "decimated." "It's uninhabitable. I would literally say that 100 percent of the infrastructure is gone. Light, water, communication, it's a total blackout," Joseph said. "It was a miracle that there was only one death," he added, referring to a 2-year-old boy. On Antigua, evacuees hunkered down, preparing for a possible hit on Saturday by Jose, a Category 4 storm packing 150 mph winds. "People are worried, when they see images of Barbuda, that it could be Antigua next," said Joseph. In Cuba, meanwhile, the government moved hundreds of thousands of people away from cities and towns along the coast in preparation for Irma, including about 36,000 tourists from hotels and beach resorts that are likely to be pounded. While Havana is expected to be spared the worst of Irma, cities such as Ciego de Avila and Santa Clara in the island's central provinces appear at risk of significant damage. State media showed images Friday of soldiers and Cuban civil defense brigades moving residents into shelters. The government said it had prepared at least 39 caves for use as emergency shelters. Children and elderly residents could be seen in them, eating sandwiches and snacks in the near-darkness. "People are being quite orderly in terms of leaving their homes and going to safer shelters," said Richard Paterson, the Cuba representative for Care International in Havana. The U.S. military has dispatched five warships, as well as helicopters, cargo planes, National Guard troops and thousands of pounds of supplies to help victims of Hurricane Irma. The military will provide generators, fuel and gas, water-purification systems and tools to clear roads choked with storm debris, according to the U.S. Northern Command. The Army Corps of Engineers sent teams to U.S. territories to help restore electricity, and National Guard personnel were activated to help with evacuations and search-and-rescue efforts. The U.S. Federal Emergency Management Agency spoke of a "complete power/communications collapse" in the U.S. Virgin Islands. France and the Netherlands moved to respond to some of Irma's worst destruction on St. Martin, an island that they share, and St. Barts, a French overseas territory. The French government deployed 455 police, military and other personnel on Friday, with double that number expected by Saturday. The presence was partly to restore public order and combat a wave of looting. Using Guadeloupe as a base, French officials were dispatching military helicopters and civilian aircraft with food, water and medical supplies. Yet Jose could quickly jeopardize those relief efforts, authorities warned. "My concern today is that because of Hurricane Jose, we are going to have another period in which transport won't be operating," the French health minister, Agnès Buzyn, told French TV. Kenneth Mapp, the governor of the U.S. Virgin Islands, said that Jose's rain and winds could linger through Sunday or Monday. On Friday, Dieter Schaede, a 37-year resident of St. Martin, picked his way through the rubble-filled side streets of Cole Bay, one of the bigger towns on the Dutch side of the island. "People are in shock," Schaede said in a telephone interview. "I'm in front of a house that was a house. The only thing you see is a kitchen wall." President Donald Trump owns an 11-bedroom beachfront estate on St. Martin. The status of the property, which is for sale for $16.9 million, is unknown. But Schaede said that he has heard that other homes in that neighborhood were badly damaged. "I'm sure it was probably devastated," he said of Trump's property. Schaede rode out the storm in a bathroom in a concrete building with his five children. All are safe. In the British Virgin Islands, residents said they lacked information on aid and relief efforts. Communications were mostly down, and many roads were blocked with vehicles, telephone poles, metal roof material and other debris. Freeman Rogers, editor of the weekly BVI Beacon newspaper and a resident of Road Town, the territory's capital, said that people at shelters were running low on food and water, clean clothes and medical supplies. He described a sense of frustration about the response by the British government. Prime Minister Theresa May has said that British military personnel have been working "round the clock" to provide relief to the battered islands. Rogers said residents were most concerned about whether Hurricane Jose would cause further damage. "People don't have roofs," he said in a telephone interview. "It'd be really rough if we got hit with another big hurricane." 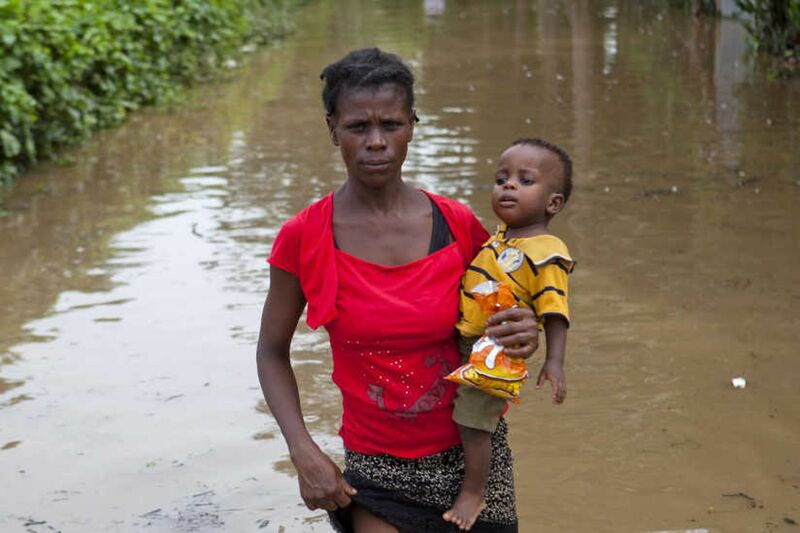 As the rains diminished over vulnerable Haiti, residents and aid organizations began to assess the damage. In the city of Cabaret, 16 miles northwest of Port-au-Prince, Miracle Lafontant, 82, wearily exited her inundated home midday Friday in a ripped and muddied white nightgown. A Christian, she's a rice farmer who has taken in three orphans – including a teenage girl who lost her mother last year in Hurricane Matthew. "I was in bed, and I heard, 'Mommy, wake up, the water is coming in!' " Lafontant said. "I got out of bed, but before I could get out the door, it was already up to here," she said, indicating her upper abdomen. Behind her home, fields of banana trees and sugar cane obscured rows of flooded houses. "The storm, she took all my church clothes, ruined," Lafontant said. "What am I going to wear to church now? "But I'm not scared. I am never scared," she said. "The Lord Jesus Christ was there with me last night." Nick Miroff, Thomas Gibbons-Neff, Matea Gold, Rachelle Krygier, and Annabell Van den Berghe contributed to this article.